I’m whittling down the list of towns within a half hour or so where I haven’t yet run a race. I know it’s going to make finishing out the map tougher later on, but it’s hard to resist knocking them off now, when I need a quick race to do and not take all day doing it. Westport is a quick drive (but Fairfield County, a world away, thank goodness), and as I arrived at the golf course (yep), I wasn’t exactly sure where to park, so I parked in the club lot, where I saw signs saying “Event Parking.” The clothing just didn’t seem to fit: everybody getting out of their cars was wearing a polo shirt; where were all the running shirts? I got out and saw the formation of men in the golf carts lining up in formation like it was the start of the Indy 500, and I knew I was in the wrong place. I walked along the road until I found the another clubhouse, and another parking lot, this one for all the runners, apparently. 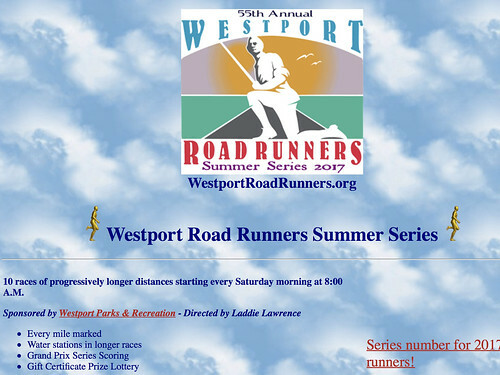 This was, like Roxbury, another event in a summer-long season of races, a series that has been going on for years and attracts a core group of competitive local runners. As in Roxbury, we got numbered tongue depressors as we finished, but instead of writing our name on a sheet, we handed our number in to one of a number of dedicated scribes after the race. This was only my second or third non-chip times event as I near fifty races, which is kind of crazy. Running is ubiquitous and systematized enough that nearly every race is as official and technically sophisticated as only major marathons used to be. The whole thing was extremely well-organized, and as before, these small club races also mean that despite a smaller number of runners, the one who show up are noticeably faster on the whole, and I found myself chasing a big pack around the course. I kept pace, mostly, but never quite caught that guy I was trading spots with the whole race.